Introducing the world’s best, fits in your pocket, saves the day, hand-held skate sharpener. What is the Blade Barber? The Blade Barber is your new steel stylist. It fits in your pocket and will turn any parent, coach, trainer into a super hero. 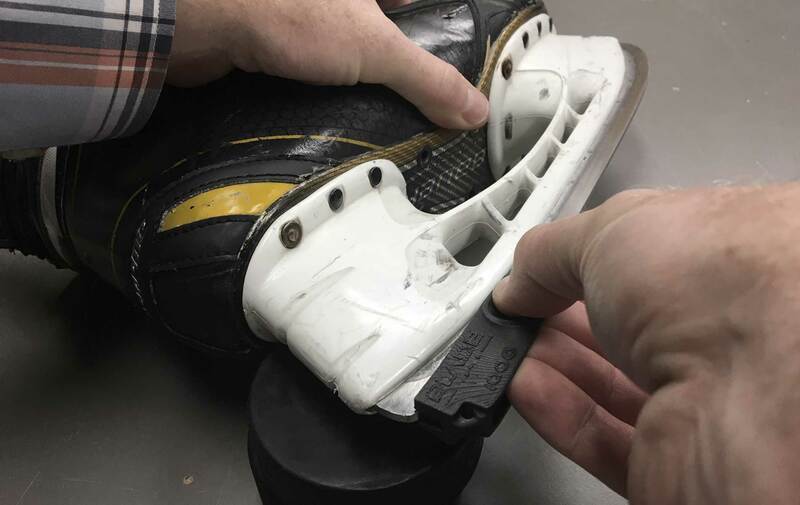 Enabling you to repair skates on the fly, or give quality sharpens at home prolonging, or avoiding, visits to the pro shop — saving you time. Unlike any other hand sharpener on the market, it will actually sharpen your skates. Made in Canada with the finest materials, the Blade Barber will ensure you never miss a shift. Learn more about the Blade Barber. Made in Canada with the finest materials, the Blade Barber will ensure you never miss a shift, well because of your skates at least. It’s as simple as stabilize, swipe and repeat. Of course it takes a little practice being a hand held tool, but with those soft hands of yours, you’ll get the hang of it in no time. Far better than any Sweet Stick or Edge Enhancer. I have been using this tool for a few months now. It takes a little while to get the hang of but I would like to think that I am pretty good with it now. I have 2 boys that play a lot who I am on the ice with plus I play myself. Needless to say I have been looking for something like this. It is a must have for any hockey trainer as I have repaired lost edges on the bench and the player has not even missed a shift. I have done at least 40 sharpens with mine and its still sharpening. My experience is that I still get my skates sharpened at Pro Hockey life or Play it again but rather than once every 1.5 to 2 weeks I now do them every 2 months. Fits in my jacket pocket on the bench - so convenient! This is the handiest tool ever for hockey players and skaters of any type. It fits into your pocket so easily you dont even know it's there. The surprising thing is that you get a top quality sharpening tool that's as good as any drop it off sharpening shop - really. Get two as everyone will want to use yours and eventually you will " lose" yours. Coaches throw 3 or 4 of them into the team hockey bag for a fast tune up. Highly Recommended. Proudly designed & made in Canada. ©2018-2019 Blade Barber Inc. All rights reserved.